A former youth hostel has been renovated thanks to European Commission funding, helping to home around 500 refugees. Jumaa Alo, a 52-year-old Kurdish Syrian from the town of Afrin, puts his arm around his wife Nabiha’s shoulders. Finally safe in a new home in Greece, their eyes fill with tears as they think back to the conflict that forced them to flee in 2011. 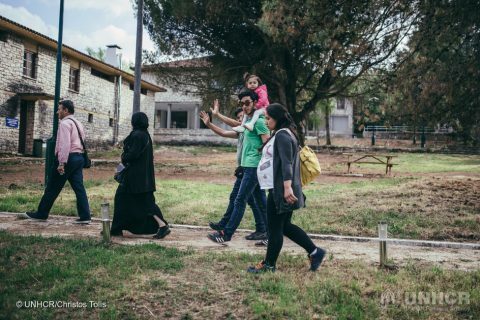 Their new home, shared with sons Mitan and Akid, daughter-in-law Zainab, and two-year-old grand-daughter Silina, is a former children’s hostel on the edge of the lakeside city of Ioannina. The family are among the first 90 refugee residents to live at Agia Eleni, which was offered to the UN Refugee Agency, UNHCR, a year ago. Then abandoned and in a state of disrepair, it has since been renovated thanks to European Commission funding and transformed into a self-contained model in the agency’s accommodation programme, with capacity for about 500 people. The programme is part of larger efforts aimed at ensuring that a sustainable and adequate reception system is put in place by the Greek Government, requiring the provision of more urban accommodation opportunities and improving living conditions. Jumaa and his family fled Syria for Lebanon in 2011, afraid that their youngest son would be forced to join the Syrian army. They lived in the neighbouring country for four years, working on farms or in fruit-packing plants. But life was tough and, after making to Turkey, they decided to make the perilous journey by boat to Europe. The family now dream of opening a pastry shop. Jumaa and his sons know how to prepare more than 100 different types of sweet baked treats. Back in Syria, the family owned two patisseries, but “they were all stolen and also my house. There is nothing, everything was stolen,” Jumaa explains. Staff from UNHCR and its NGO partner Intersos are helping them to get settled in the spacious facility, whose distinctive and attractive stone and timber buildings were designed more than half a century ago by the late Constantinos Doxiadis, a Greek architect best known for leading the team that created Pakistan’s capital, Islamabad. Agia Eleni has living, dining and sleeping quarters, areas for indoor and outdoor activities and sports, and water, sanitation and hygiene infrastructure. Families can prepare meals and access nearby shops, where they are able to buy basic provisions with cash cards issued by UNHCR under a scheme funded by the European Commission. A full range of basic services will be provided by UNHCR and partners in coordination with the Ministry of Migration Policy. 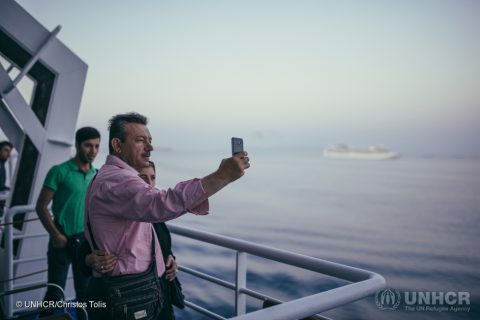 Jamaa and his wife, who have health problems, are now looking forward to a brighter future, and one where they can be reunited with their three other sons who had made their way earlier to Greece, where they were taken to Athens and accepted for relocation in the Netherlands.